Never forget to take your vitamins and pills. Pack them into your water bottle. This water bottle pill holder has a seven-compartment pill organizer built into it, so you always have water when the clock strikes time-to-take-your-pills. The pegs on the side prop it up, so you can load up your supply for the week, and the cap doubles as a cup. Liquid capacity: 20 fl. oz. Dimensions: 2.75" x 2.75" x 9.25"
This pill and water carrier was great. Made taking pills convient and easy. Love this color and it works well. 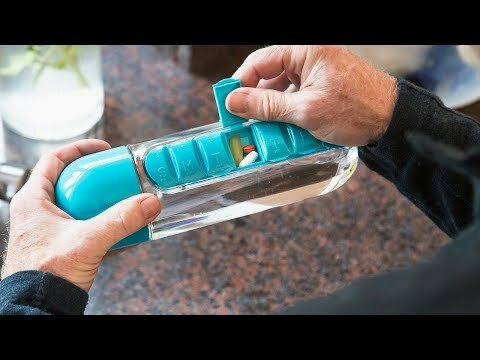 This water bottle pill holder seamlessly combines two things that belong together. 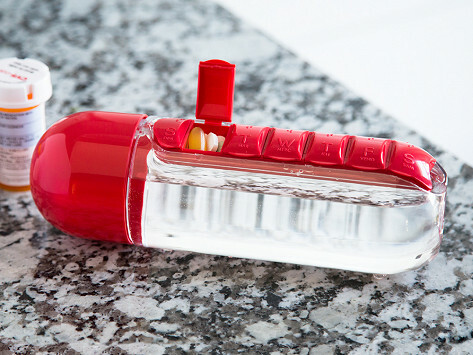 Thanks to its clever design, you’ll always have water when taking your daily medications and vitamins. Not only is there a removable, seven-compartment pill organizer embedded into the bottle, the Asobu folks thought of everything. Tiny built-in pegs prop the bottle up while you load pills for the week. The cap doubles as a portable cup. And the wide-mouth top is perfect for drinking. Future you will thank you for planning out the week. And present you will have to try really hard to forget to take your pills.